LOOK FOR INSURANCE GAPS. Many folks agonize over whether their policies are too large or small. A bigger danger: Not having coverage at all, because your life has changed but your insurance hasn’t kept up. Just had kids? It’s time for life insurance. Grown wealthy? Consider umbrella liability insurance. Started working for yourself? You may need disability coverage. We’ve written a good bit about insurance. Here’s an article about getting properly insured. How is insurance different for those in the military? It is a little more complicated. First, many life insurance policies have war/military clauses. Some cater to the military, though, and aren’t as restrictive. Here’s how to buy life insurance in the military. Also, don’t forget about the other death benefits of being in the military. It is also hard to get supplemental disability insurance (DI) if you need it. Most of us in the military are okay with the coverage we get from the military’s disability system, but if you are a top earner like a pilot, nuclear engineer, doctor, dentist, or someone else with a high salary and bonuses, you might want to check out this article on the White Coat Investor. While written for doctors, those companies also will sell insurance to other military high earners. Disability insurance – I used to have supplemental DI, but I cancelled it because I no longer need it due to my adequate net worth and the military disability system. Medical insurance – TRICARE Prime, baby! Which is the most under-appreciated benefit of being in the military, by the way. 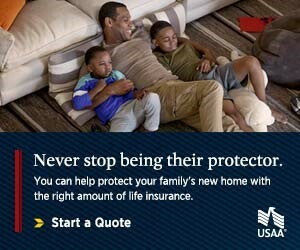 Homeowner’s insurance – Got that through USAA. Renter’s insurance – I don’t rent, but when I did I had it through USAA. Auto insurance – I have our three vehicles insured through USAA, although I don’t have comprehensive/collision on two of the three vehicles, both of which are used and worth less than $10,000. I only use insurance to cover risks I can’t afford, and I can afford to repair or replace them if they get damaged. Umbrella liability insurance – I have enough to cover my net worth, which is the recommendation. Life insurance – I only have SGLI right now because I no longer need more than that. I’ve had as much as $3,000,000 total during my life, most of it through Navy Mutual Aid Association. Flood insurance – I’ve got flood insurance through FloodSmart.gov.